﻿﻿﻿Dr. Ruan received her medical deg﻿﻿﻿ree in China in 1990, and completed her post-graduate training in ophthalmology in 1993. She then served as a staff ophthalmologist at the prestigious Beijing Eye Institute in China, and later as an eye researcher at the University of Oklahoma Health Sciences Center. She obtained her Doctor of Optometry degree from the New England College of Optometry, Boston, MA, in 2005. Dr. Ruan is now a licensed optometric physician in Oklahoma. ﻿Dr. Ruan ﻿is a recipient of numerous awards, which include a travel award from the Japan Ophthalmologist Association for clinical training in Tokyo, Japan, a fellowship award from the American Heart Association, a travel award from the Oklahoma Chapter of the Society for Neuroscience for her achievements in eye research, and membership of Beta Sigma Kappa International Optometric Honor Fraternity. Most recently, she is recognized by Optometry Cares, The AOA Foundation and The American Optometric Association (AOA) for her commitment to Healthy Eyes Healthy People, a national initiative promoting eye health. Dr. Ruan is a member of American Optometric Association, Oklahoma Association of Optometric Physicians and a member of AOA contact lens and cornea section. Dr. Ruan has years of experience diagnosing and treating vision and eye health problems. Her areas of expertise are management of age related eye diseases and vision problems, environmental such as school, work or computer related vision problems, and sports vision. Dr. Ruan fits all types of contact lens. She has many publications and presentations in the eye and vision journals and conferences. 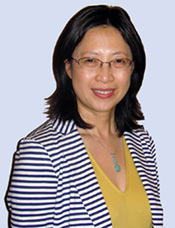 Dr. Ruan enjoys cooking, swimming and spending time with friends and family in her spare time﻿. Ben brings life to the office. He always has a smile on his face and is ready to help the patients. Ben supervises the office duties, assist patients with frame selection and all other optical and vision health needs. Ben spends his free time traveling, spending time with family and friends and playing video games. Nicole recently earned her bachelors in biology and is pursuing her dream of becoming an Optometrist. Nicole is the lead technician in the office. Nicole is in charge of pretesting, in-house glasses edging, and helps with outside services. Nicole enjoys her free time spending time with her family and friends, but most of all traveling. KaCee is the first face you'll see when walking in to the office and first to check in patients. KaCee also coordinates and travels with the doctor to serve seniors in our Community Care Services. In her free time, she enjoys going to the lake or any outdoor activities, but especially spending time with her son, Troy. Tom has been working in the eye field for several years now. With a lot of experience under his belt, he is capable of handling your optical needs. Tom is in charge of our in office lab, also he helps patients select frames and lens materials. In his free time, Tom enjoys sleeping in, playing video games and traveling. Click here to learn more from our office newsletter.